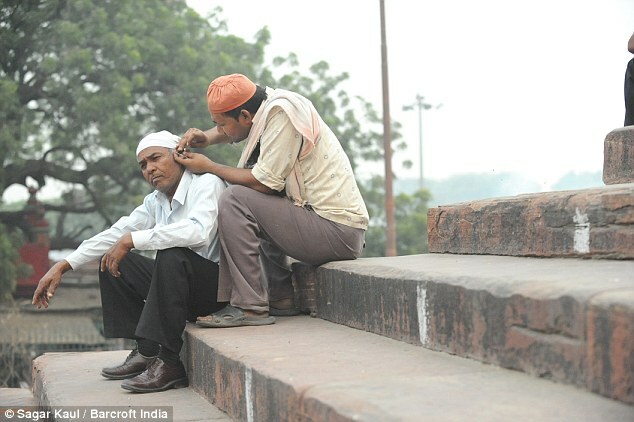 Wincing in pain, these Indian men are allowing a stranger to clean their ears in the street - with a steel needle and cotton wool. 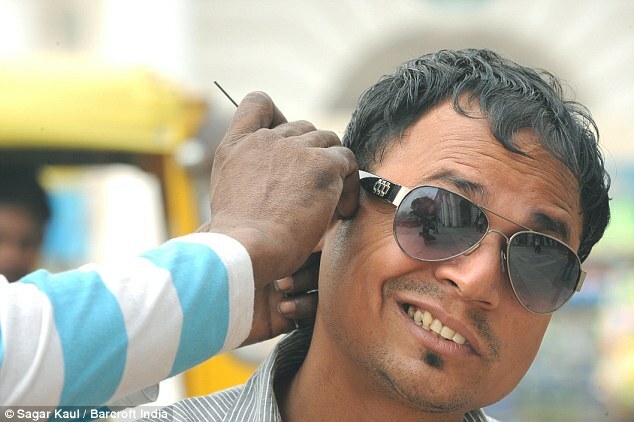 Muhammad Abbas, 38, has made a living from cleaning peoples lug holes ever since his father taught him the trade. 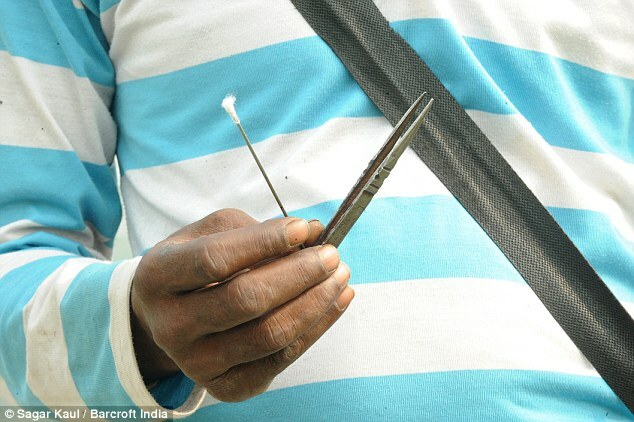 His only tools are a sharp steel needle, a wad of cotton and a pair of pincers to remove any loose wax - all of which he stores in his hat as he roams Old Delhi's streets for custom. 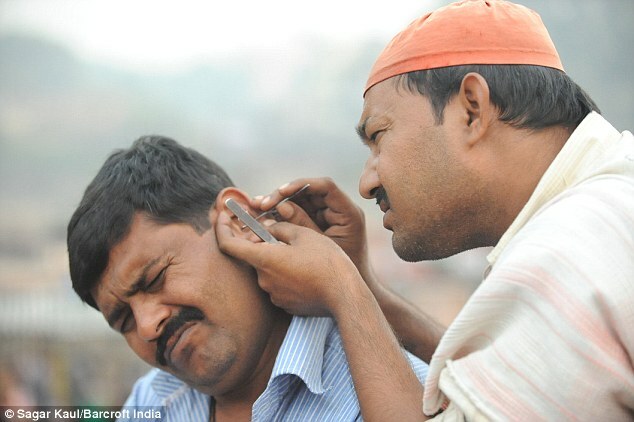 But he now claims the profession is a dying business, as younger generations opt to use ear buds instead. 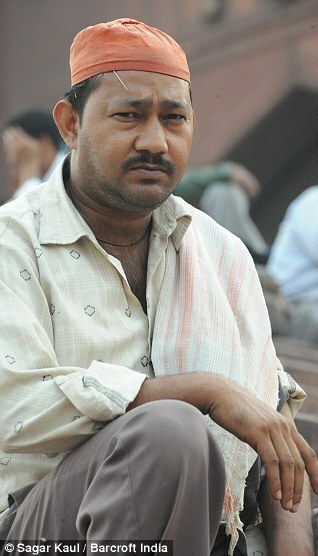 He said: 'I was taught by my father, who in turn learnt it from his grandfather. 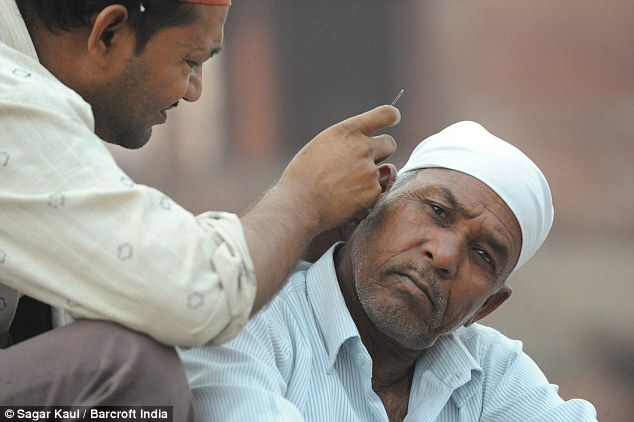 Our family has been cleaning ears since the Mughal times. 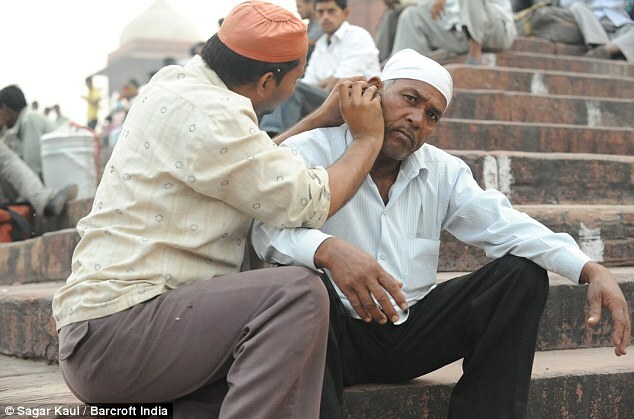 Masters: Sadanand, 35, cleans the ears of Sunil at Delhi's Connaught Place (left) while Mohhamed Abbas, 38, (right) said his family has been cleaning ears since the Mughal times Muhammad earns anywhere between 20-50 rupees (25p to 60p) for cleaning one ear. 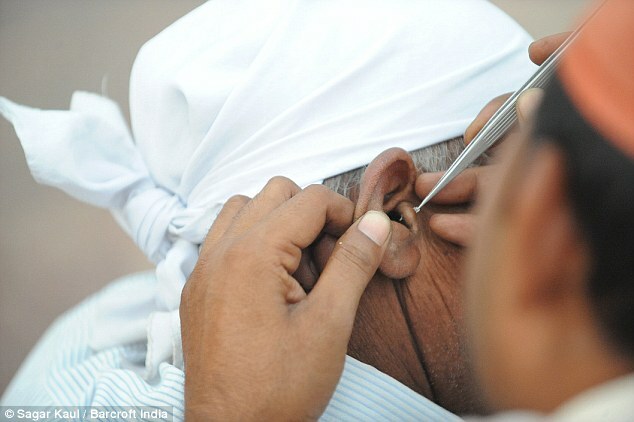 The same procedure at a specialist ear clinic in the UK would set you back as much as £70. 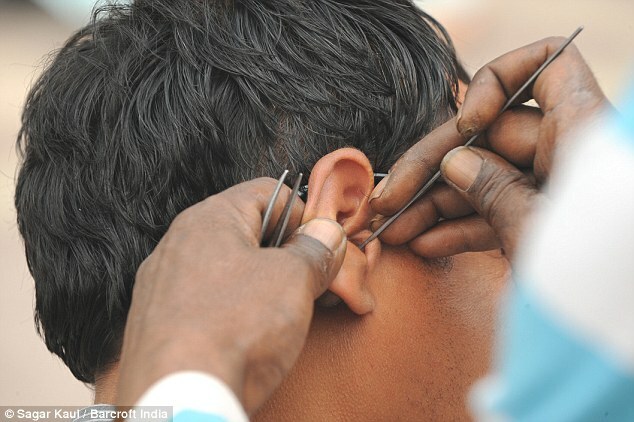 The professional ear cleaners wrap the steel needle in cotton wool before sliding it into the customers ear. After soaking up the wax, they then slowly remove the needle - before using the pincers to pick out any stray wax or cotton. 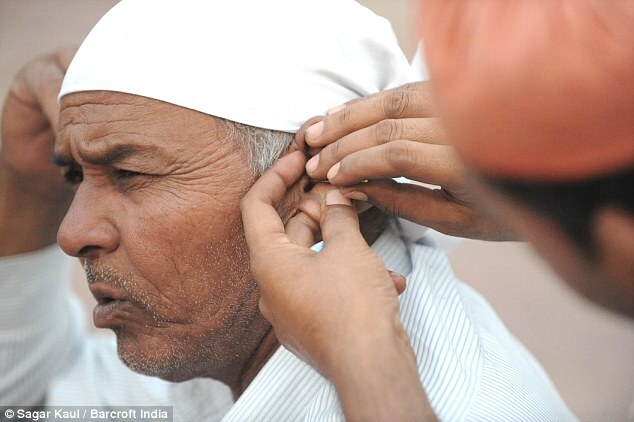 Probe a lobe: After soaking up the wax, they then slowly remove the needle - before using the pincers to pick out any stray wax or cotton Despite the apparent dangers, most of Muhammad's customers are not worried about injury or infection But despite the apparent dangers, most of Muhammad's customers are not worried about injury or infection. 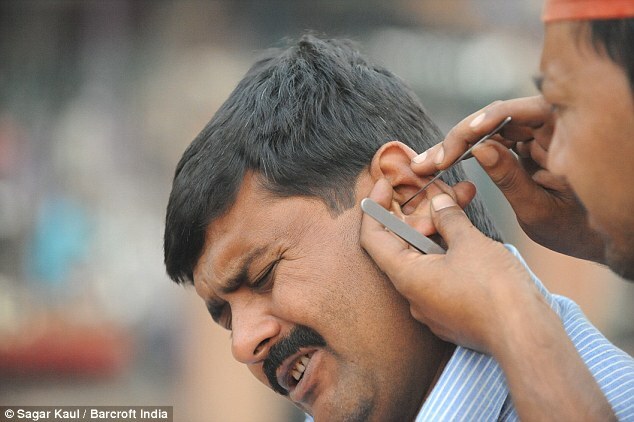 Another ear cleaner Sadanand, 35, who caters for upmarket customers in Connaught Place, New Delhi, claims business has been going down hill in recent years.